According to the National Institute on Aging, aging is associated with changes in dynamic biological, physiological, environmental, psychological, behavioral, and social processes. Some age-related changes can lead to declines in function of the senses and activities of daily life and increased susceptibility to and frequency of disease, frailty, or disability. Aging is a natural process, and try as we may, there is no escaping its inevitable repercussions. Even though there is no fountain of youth that we can drink from to set off this ticking clock and no magic spell to cast away the shadow of advancing age, the overwhelming wish to look young and stay healthy forever still remains. Most of us are willing to try every trick in the book, from unconventional diets and strenuous workouts to radical skincare products, to fulfill our aspirations for eternal youth and to look and feel our best regardless of our age. Good news is that with people becoming more conscious and proactive instead of resigning themselves to this age-related degeneration, a slight increase in life expectancy has been recorded. A 2007 study published in the Clinical Interventions in Aging reports that the lengthening of life expectancy is mainly due to the elimination of most infectious diseases occurring in youth, better hygiene, and the adoption of antibiotics and vaccines. While it’s undeniable that medicines and antiaging beauty lines serve as our trusted aids against the onslaught of time, they can only do so much in the absence of a well-balanced and holistically healthy diet and lifestyle. In fact, an overbearing reliance on pharmacological drugs to manage your age-related ailments can prove to be doubly detrimental to your health in the long run, all thanks to their grievous side effects. Similarly, camouflaging your wrinkles and fine lines under layers of makeup or trying out every unvetted skin-restorative product that enters the market can further take a toll on your skin. In short, you cannot expect to turn back the years until you start taking care of your body from within. To that end, a well-thought-out and compensatory dietary plan can significantly delay the body’s aging process and the subsequent breakdown of body function. It is well known that poor nutrition contributes to disease and premature aging, whereas a healthy diet provides your body with essential nutrients to keep your organs in good working condition. Plus, consuming healthy foods have a significant bearing on how your body responds to and combats the typical degenerative problems brought about by aging. A 2015 study published in Healthcare (Basel) reports that meeting the diet and nutrition needs of older people is crucial for their maintenance of health, functional independence, and quality of life. There are several foods that can help defy the clock and keep you looking and feeling young for years. 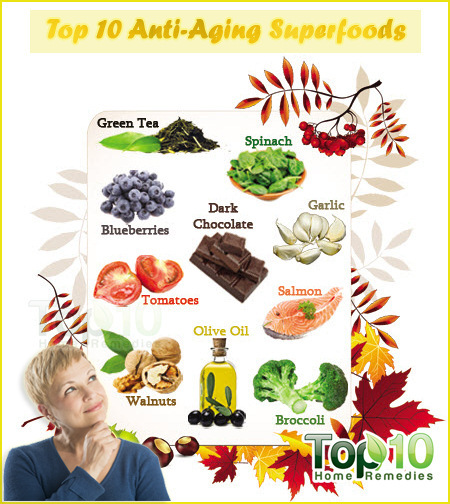 Here are 10 anti-aging foods. Replete with polyunsaturated fats, the omega-3 fatty acid content of walnuts is so high that 1/4 cup of this superfood provides approximately 113 percent of the daily recommended intake of omega-3 fatty acids. These essential fatty acids help regulate your cholesterol level and reduce the risk of heart disease. These phytochemicals also help mitigate the inflammatory pressure on your brain and thereby preserve and promote cognitive activity for years to come. Moreover, walnuts are a godsend for your age-related skin woes; their inherent omega-3 fatty acids help fortify the skin from sun damage, strengthen skin cell membranes, and impart the skin with a healthy glow by preserving its natural oil barrier. A 2012 study published in the journal Brain, Behavior, and Immunity suggests that taking enough omega-3 fatty acid supplements works to change the balance of oils in the diet and could slow a key biological process linked to aging. Another study published in Nutrients in 2014 reports that omega-3 PUFAs are now identified as potential key nutrients, safe and effective in the treatment and prevention of several negative consequences of aging. Adding further merit to this essential nutrient, a 2014 study published in the Journal of Nutrition concludes that the polyphenolic compounds found in walnuts not only reduce the oxidant and inflammatory load on brain cells but also improve intraneuronal signaling, increase neurogenesis, and enhance the sequestration of insoluble toxic protein aggregates. Moreover, a 2016 study published in Frontiers in Aging Neuroscience acknowledges walnut’s capabilities as a brain food by stating that regular consumption of this nut can delay the onset of age-related cognitive impairment and retinal pathology. Plus, walnuts contain magnesium, iron, zinc, potassium, selenium, copper, and fiber that are required to keep your body healthy and energetic as you age. Last but not least, they will help you keep your waistline trim as you get older. Walnuts can be eaten as a snack or added to salads, yogurt, and stir-fries. Be sure not to have more than a handful of unsalted walnuts at a time to keep calories in check. Antioxidants possess some significant age-defying prowess, and lucky for you, the readily available and scrumptious blueberries can give you more than your fill of these potent compounds. The main antioxidant compounds in blueberries belong to a large family of polyphenols called flavonoids. Blueberries have perhaps one of the highest concentrations of proanthocyanins and anthocyanins, which can be credited with their strong antioxidant activities. The antioxidants work as free radical scavengers and help combat and repair the age-related oxidative damage caused by the free radicals, which is often at the root of several serious diseases and premature aging. Furthermore, the powerful antioxidants in blueberries also yield significant neurological benefits for the aging population by mitigating age-related deficits in memory and motor function. The abundant supply of antioxidants coupled with high levels of vitamins A and C make blueberries a boon for preserving your skin’s youthfulness. By moderating your inflammatory response and preventing collagen loss, blueberries can help shield your skin from sun-, stress- or pollution-induced damage. A 2006 study published in Aging Cell concludes that the polyphenolic compounds in blueberries had robust and reproducible benefits during aging that were separable from antioxidant effects. A 2010 study published in the Journal of Agricultural and Food Chemistry suggests that moderate-term blueberry supplementation can confer neurocognitive benefit. This study establishes a basis for more comprehensive human trials to study the preventive potential and neuronal mechanisms of blueberries. 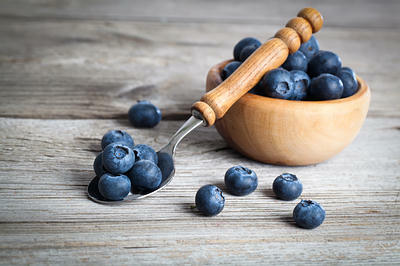 A study published in Gerontology in 2012 suggests that the polyphenolic compounds found in blueberries exert their beneficial effects either through their ability to lower oxidative stress and inflammation or directly by altering the signaling involved in neuronal communication. These interventions, in turn, may protect against age-related deficits in cognitive and motor function. You can have blueberries with your cereal, eat them with ice cream or yogurt, or enjoy them as a fruit snack. Spinach is highly rich in antioxidants. A 2013 report published in Food Analytical Methods found spinach to have an exceptionally high total polyphenol and flavonoid content. Spinach is a great source of lutein and zeaxanthin, two powerful antioxidants that greatly help reduce age-related mental decline, eye and vision conditions, and bone degeneration. A 2014 study published in Preventive Nutrition and Food Science found that increased consumption of fresh vegetables that are high in polyphenols such as spinach has been associated with a reduced risk of oxidative stress-induced disease. Not only that, but spinach also has a high amount of vitamins A, C, and E as well as beta-carotene, all of which help protect the skin from the sun’s harmful ultraviolet rays, so your skin remains vibrant and healthy even as you age. Vitamin C, in particular, helps stimulate collagen synthesis, whereas vitamin A promotes wound healing. A study published in the British Journal of Nutrition in 2010 demonstrated that women who consumed a higher intake of green and yellow vegetables had a lower incidence of wrinkles. Spinach is also a good source of vitamin K, which is associated with lower concentrations of inflammatory markers in the body. This was demonstrated by a 2008 study published in the American Journal of Epidemiology. A 2018 report in the journal Neurology found that a diet containing approximately one serving of green leafy vegetables per day is associated with slower age-related cognitive decline. In addition, green vegetables such as spinach can help prevent cardiovascular disease, lower high blood pressure, and lower cholesterol levels. It can even reduce the risk of cancer in the digestive tract. Not to forget, spinach is generously supplied with high doses of iron, an essential nutrient that one cannot do without and yet most of us generally run low on. 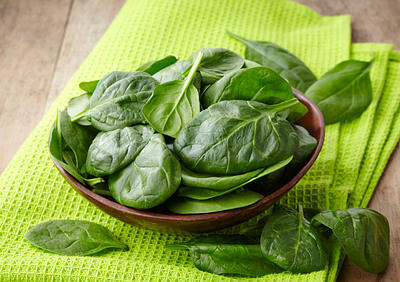 Just 1 cup of fresh spinach daily can keep your body healthy and your skin young for years. You can eat spinach in salad, soup, or juice form. Green tea is a commonly used ingredient for the manufacture of a host of beauty products due to its powerful antioxidant properties, which help protect the skin from harmful free radicals that cause wrinkling, brown spots, and skin aging. These antioxidants can slow down premature aging and help keep your skin looking young and supple by reversing free radical-induced cellular damage. This healthy beverage also helps protect against skin cancer. The phenomenal success of green tea as a skin-friendly beverage can be attributed to its rich content of catechin polyphenols, compounds that work with other chemicals to increase fat oxidation to utilize the burnt fat as fuel for the body. 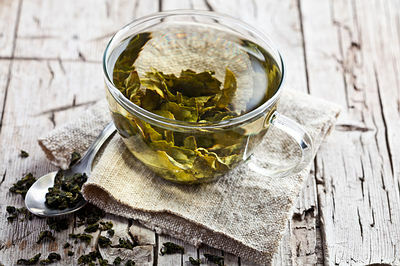 A 2003 study published in the International Journal for Vitamin and Nutrition Research suggests that green tea is able to delay collagen aging by an antioxidant mechanism that is in part duplicated by the combination of vitamin C and E. This research was conducted on mice and therefore warrants further human trials to conclusively establish this claim. In a 2005 study published in Dermatological Surgery, it was found that participants treated with a combination regimen of topical and oral green tea showed histologic improvement in elastic tissue content. Green tea polyphenols have been postulated to protect human skin from the cutaneous signs of photoaging, but clinically significant changes could not be detected. Longer supplementation may be required for clinically observable improvements. Green tea has also been shown to help prevent heart disease and high cholesterol, prevent and reduce the risk of rheumatoid arthritis, and preserve bone density. A 2007 study reports that green tea polyphenols, particularly epigallocatechin gallate (EGCG), can aid in the prevention of cardiovascular diseases in which oxidative stress and proinflammation are the principal causes. A 2010 study published in the Chinese Medical Journal reports that long-term consumption of tea catechins (present in green tea) could be beneficial against high-fat-diet-induced obesity and type 2 diabetes and could reduce the risk of coronary disease. In a 2012 study published in the American Journal of Clinical Nutrition, researchers concluded that green tea consumption has a significant association with a lower risk of incident functional disability, even after adjustment for possible confounding factors. If you wish to look younger than your age, 1 or 2 cups of green tea daily can help a lot. You can also try green tea supplements. 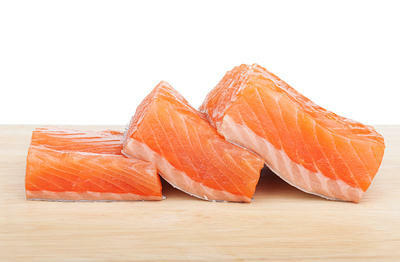 Salmon is an excellent source of omega-3 fatty acids and hence can be used to delay the aging process. Omega-3 fatty acids help prevent cholesterol buildup in the arteries, protect against abnormal heart rhythms, and keep you mentally sharp as you age. A 2008 study published in the American Journal of Clinical Nutrition reports that modest fish consumption was associated with a lower risk of total cardiovascular disease, consistent with cardiac mortality benefits but not with total cancer or overall major chronic disease; n-6 fatty acid consumption did not influence these relations. Another 2010 study published in the American Journal of Clinical Nutrition found an inverse association between higher intakes of long-chain n23 PUFAs and regular weekly consumption of fish and hearing loss. Thus, it’s safe to say that dietary intervention with n23 PUFAs could prevent or delay the development of age-related hearing loss. Giving more weight to the health claims attributed to fish consumption, a 2016 study published in Neurology reports that eating a seafood meal or other foods containing omega-3 fatty acids at least once a week may protect against age-related memory loss and other cognitive problems in older people. The anti-inflammatory properties and high protein content of salmon also help keep your skin free from blemishes, acne breakouts, and various signs of aging such as wrinkles, brown spots, crow’s feet, and fine lines. Furthermore, salmon is also said to possess concentrated amounts of astaxanthin, a natural pigment that’s been touted as one of the most powerful antioxidants to combat aging by preserving cell longevity. A 2011 study published in Experimental Dermatology found omega-3 polyunsaturated fatty acids (n-3 PUFA) as promising skin-protective candidates with the potential to shield the skin from UVR injury through a range of mechanisms. In addition, this cold-water fish is rich in antiaging nutrients including vitamins D and E.
Try to have three or four servings of salmon per week. You can opt for grilled, smoked, or baked salmon. Broccoli, among other cruciferous vegetables, can significantly slow down the aging process as it boasts high levels of antioxidants and an impressive number of antiaging nutrients. This superfood contains the compounds sulforaphane and indoles, which help protect against oxidative stress-induced cell damage and might even mitigate the risk of cancer. A 2008 study published in the Journal of Allergy and Clinical Immunology shows that sulforaphane, a chemical in broccoli, switches on a set of antioxidant genes and enzymes in specific immune cells, which then combat the injurious effects of molecules known as free radicals that can damage cells and lead to diseases. Broccoli is also laden with a natural compound called nicotinamide mononucleotide (NMN), which was found to engender a health-positive impact on older mice. In a 2016 study published in Cell Metabolism, feeding older mice a high dose of nicotinamide mononucleotide (NMN) along with drinking water resulted in improved skeletal muscle, liver, and eye function, insulin sensitivity, immune function, body weight, and physical activity levels in the subjects. While these benefits are not completely unfounded, similar studies have to be replicated on human subjects to make these findings more worthwhile. In another study published in Scientific Reports in 2016, researchers boosted the potency of a broccoli-related compound by 10 times and identified it as a possible treatment for age-related macular degeneration (AMD), the leading cause of vision loss affecting more than 10 million older Americans. Moreover, a 2010 study published in the British Journal of Nutrition expounds upon how broccoli is good for your skin. The researchers measured elasticity and other skin qualities in more than 700 Japanese women and found that those who ate more green and yellow vegetables had fewer wrinkles. Furthermore, the folate (a B vitamin) in broccoli helps ensure optimal brain functioning with advancing age, whereas the vitamin K1 in it increases bone density and reduces fracture risk. Plus, broccoli is rich in artery-clearing fiber, bone-strengthening calcium, and heart-healthy potassium. Olive oil is high in antioxidants, including vitamins A and E. While vitamin A protects the skin from free radicals responsible for accelerating the aging process, vitamin E aids in skin repair and renewal. 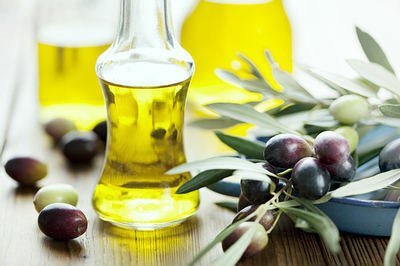 Olive oil has strong anti-inflammatory effects on the skin and may protect it from sun damage. A 2014 study published in the Journal of Drugs in Dermatology reports that olive oil has antioxidant properties and may play a role in the treatment and prevention of photoaging. 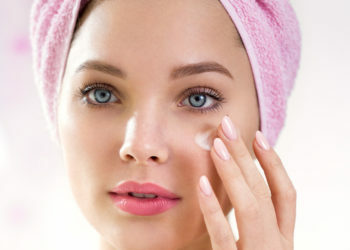 Thus, higher intake of olive oil means lesser fine lines, fewer wrinkles, a more even skin tone and smooth texture. This is further corroborated by a 2010 study published in the British Journal of Nutrition, which reports that optimum fat intake can prevent or offset skin wrinkling. The monounsaturated fatty acids in olive oil can also improve heart health, lower cholesterol levels, and control blood sugar. A 2016 study published in PLOS One throws light upon the protective effect of olive oil consumption against advanced-age macular disease in the elderly community-dwelling population. However, the characterization of the mediating nutrients deserves further research. A 2018 study published in the Food Quality: Balancing Health and Disease demonstrates that olive oil antioxidants contribute to eliminating free radicals, which are molecules involved in the development of human cancer, some chronic disease, and aging. Furthermore, the quantity of olive oil consumed is inversely proportional to age-related cognitive decline and memory loss, dementia, and Alzheimer’s disease. Thus, virgin olive oil can be considered a functional food, which provides health benefits, including the prevention of several diseases. To enjoy the antiaging benefits of olive oil, use it as your regular cooking oil. Also, this healthy oil can be used as a bath oil and as a topical moisturizer. Dark chocolate is a superfood. It is loaded with antioxidants that help protect your body from free radicals, which cause oxidative damage to cells. Free radicals can speed up the aging process and also cause different types of cancer. The cocoa present in dark chocolate has flavanols that encourage blood vessels to relax, keeping them youthful, supple, and pliable. This, in turn, lowers risk of high blood pressure, type 2 diabetes, kidney disease, and dementia. A 2008 study published in the Journal of Nutrition suggests flavanol-rich, low-energy cocoa food products may have a positive impact on CVD risk factors. Another 2014 study published in the British Journal of Nutrition found that a high-flavanol cocoa and dark chocolate treatment was associated with enhanced vasodilation in both conduit and resistance arteries and was accompanied by significant reductions in arterial stiffness in women. Eating dark chocolate also benefits your skin health. A 2006 study published in the Journal of Nutrition reports that dietary flavanols from cocoa contribute to endogenous photoprotection, improve dermal blood circulation, and affect cosmetically relevant skin surface and hydration variables. Another study published in the European Journal of Nutrition in 2007 lends support to this health claim by demonstrating that consumption of flavanol-rich cocoa acutely increases dermal blood flow and oxygen saturation. In the same vein, another 2009 study published in the Journal of Cosmetic and Dermatology demonstrated that regular consumption of a chocolate rich in flavanols confers significant photoprotection and can thus be effective at protecting human skin from harmful UV effects. However, conventional chocolate has no such effect. Eat dark chocolate in moderation, as it is high in calories and saturated fat that can cause weight gain. 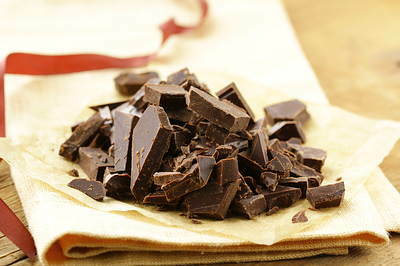 Stick to a small piece of dark chocolate with at least 70 percent cocoa. 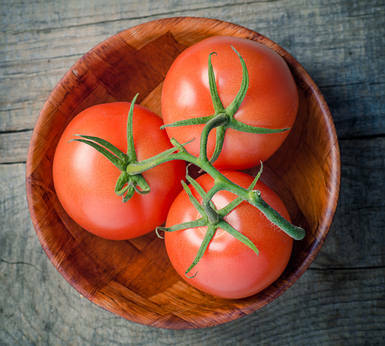 A tomato a day can reverse the effects of aging. Lycopene is the major carotenoid of tomato and can be credited with a number of favorable antiaging benefits. Lycopene protects the skin from harmful free radicals and acts as a natural sunblock that shields the skin from UV damage, thereby diminishing the occurrence and appearance of sun spots, dryness, and wrinkles. A 2001 study published in the Journal of Nutrition demonstrates that it is feasible to achieve protection against UV light-induced erythema in humans by ingestion of a commonly consumed dietary source of lycopene such as tomato paste. Reinforcing these findings is a 2011 study published in the British Journal of Dermatology, which reports that tomato paste containing lycopene provides protection against acute and potentially longer-term aspects of photodamage. Also, a tomato-rich diet boosts the production of collagen, the protein that keeps skin supple by preserving its strength and elasticity. Tomatoes also have the ability to cut cholesterol, prevent heart disease, and ward off a range of cancers. A 2012 study published in Experimental and Therapeutic Medicine found that consumption of tomatoes has a positive effect on platelet antiaggregation activity and endothelial protection, which may be beneficial for cardiovascular health. Another 2012 study published in Neurology shows that high serum concentrations of lycopene, as a marker of intake of tomatoes and tomato-based products, decrease the risk of any kind of stroke, including ischemic stroke in men. For optimum health and good-looking skin, try to drink 1 glass of tomato juice daily. You can also incorporate tomatoes in your salads or soups. 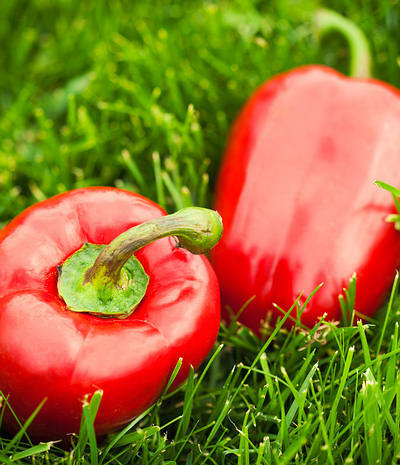 Red bell peppers are loaded with antioxidants that offer antiaging benefits. In addition to their high content of vitamin C-which is good for collagen production-red bell peppers contain powerful antioxidants called carotenoids, such as alpha-carotene, beta-carotene, lycopene, lutein, cryptoxanthin, and zeaxanthin. Carotenoids are plant pigments responsible for the bright red, yellow, and orange colors you see in many fruits and vegetables. Orange pepper was found to exhibit the highest concentration of zeaxanthin among all other varieties. A 1996 study published in the Journal of Herbs, Spices & Medicinal Plants reports that red bell pepper is an excellent source of natural micronutrient antioxidants (vitamins C and E and carotenoids), which appear to be critically important in preventing and reducing chronic and age-related diseases. A 2014 study published in Nutrients highlights the beneficial (protective) effects of dietary carotenoid intake in exemplary widespread modern civilization diseases, including cancer, cardiovascular diseases, and photosensitivity disorders, in the context of carotenoids’ unique antioxidative properties. They have a variety of anti-inflammatory properties and may help protect the skin from sun damage, pollution, and environmental toxins. Slice bell peppers and dip them in hummus as a snack, add them to your raw salad, or cook them up in a stir-fry. Understanding the Dynamics of the Aging Process. National Institute on Aging. https://www.nia.nih.gov/about/aging-well-21st-century-strategic-directions-research-aging/understanding-dynamics-aging. Tosato M, Zamboni V, Ferrini A. The aging process and potential interventions to extend life expectancy. Clinical Interventions in Aging. https://www.ncbi.nlm.nih.gov/pmc/articles/PMC2685272/. Published September 2007. Leslie W, Hankey C. Aging, Nutritional Status, and Health. Healthcare. https://www.ncbi.nlm.nih.gov/pmc/articles/PMC4939559/. Published July 30, 2015. Souza RGMde, Schincaglia RM, Pimentel GD. Nuts and Human Health Outcomes: A Systematic Review. Nutrients. https://www.ncbi.nlm.nih.gov/pmc/articles/PMC5748761/. Published December 2, 2017. Omega-3 Supplements May Slow A Biological Effect of Aging. Ohio State News. https://news.osu.edu/omega-3-supplements-may-slow-a-biological-effect-of-aging/. Published September 30, 2012. Molfino A, Gioia G, Muscaritoli M. The Role for Dietary Omega-3 Fatty Acids Supplementation in Older Adults. Nutrients. https://www.ncbi.nlm.nih.gov/pmc/articles/PMC4210907/. Published October 3, 2014. Poulose SM, Miller MG, Hale BS-. 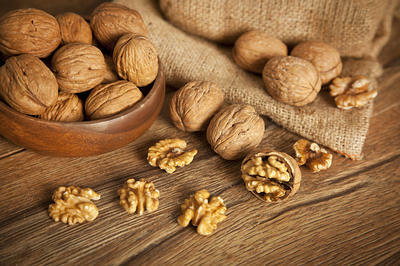 Role of Walnuts in Maintaining Brain Health with Age. The Journal of Nutrition. https://academic.oup.com/jn/article/144/4/561S/4571638. Published February 5, 2014. Rajaram S, Pedret CV-, Cofán M. The Walnuts and Healthy Aging Study (WAHA): Protocol for a Nutritional Intervention Trial with Walnuts on Brain Aging. Frontiers in Aging Neuroscience. https://www.ncbi.nlm.nih.gov/pmc/articles/PMC5222811/. Published January 10, 2017. Huang W- yang, Zhang H- cheng, Liu W- xu. Survey of antioxidant capacity and phenolic composition of blueberry, blackberry, and strawberry in Nanjing. Journal of Zhejiang University Science B. https://www.ncbi.nlm.nih.gov/pmc/articles/PMC3274736/. Published February 2012. Zhang J, Lazarenko OP, Blackburn ML, Badger TM, Ronis MJ, Chen JR. Blueberry consumption prevents loss of collagen in bone matrix and inhibits senescence pathways in osteoblastic cells. Age. https://www.ncbi.nlm.nih.gov/pubmed/22555620. Published June 2013. Wilson MA, Hale BS-, Kalt W. Blueberry polyphenols increase lifespan and thermotolerance in Caenorhabditis elegans. Aging Cell. https://www.ncbi.nlm.nih.gov/pmc/articles/PMC1413581/. Published February 2006. KRIKORIAN ROBERT, SHIDLER MARCELLED, NASH TIFFANYA. Blueberry Supplementation Improves Memory in Older Adults. Journal of Agricultural and Food Chemistry. https://www.ncbi.nlm.nih.gov/pmc/articles/PMC2850944/. Published April 14, 2010. Shukitt B-H. Blueberries and Neuronal Aging. Gerontology. 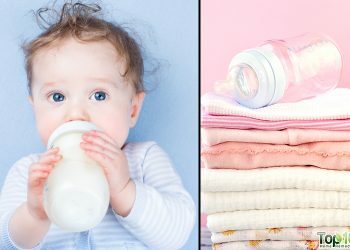 https://www.karger.com/Article/FullText/341101. Published August 16, 2012. Ligor M, Trziszka T, Buszewski B. Study of Antioxidant Activity of Biologically Active Compounds Isolated from Green Vegetables by Coupled Analytical Techniques. Food Analytical Methods. https://link.springer.com/article/10.1007/s12161-012-9367-9. Published June 6, 2012. Ko S- H, Park J- H, Kim S- Y. Antioxidant Effects of Spinach (Spinacia oleracea L.) Supplementation in Hyperlipidemic Rats. Preventive Nutrition and Food Science. https://www.ncbi.nlm.nih.gov/pmc/articles/PMC3999804/. Published March 2014. Nagata C, Nakamura K, Wada K, et al. Association of dietary fat, vegetables and antioxidant micronutrients with skin ageing in Japanese women. British Journal of Nutrition. https://www.ncbi.nlm.nih.gov/pubmed/20085665. Published May 2010. Shea MK, Booth SL, Massaro JM. Vitamin K and Vitamin D Status: Associations with Inflammatory Markers in the Framingham Offspring Study. American journal of Epidemiology. https://www.ncbi.nlm.nih.gov/pmc/articles/PMC3151653/. Published November 15, 2008. Morris MC, Wang Y, Barnes LL, Bennett DA, Dawson-Hughes B, Booth SL. Nutrients and bioactives in green leafy vegetables and cognitive decline: Prospective study. Neurology. https://www.ncbi.nlm.nih.gov/pubmed/29263222. Published January 16, 2018. Rutter K, Sell DR, Fraser N. Green Tea Extract Suppresses the Age-Related Increase in Collagen Crosslinking and Fluorescent Products in C57BL/6 Mice. International Journal for Vitamin and Nutrition Research. https://www.ncbi.nlm.nih.gov/pmc/articles/PMC3561737/. Published November 2003. Chiu AE, Chan JL, Kern DG, Kohler S, Rehmus WE, Kimball AB. Double-blinded, placebo-controlled trial of green tea extracts in the clinical and histologic appearance of photoaging skin. Dermatologic Surgery. https://www.ncbi.nlm.nih.gov/pubmed/16029678. Published July 2005. Tipoe GL, Leung TM, Hung MW, Fung ML. Green tea polyphenols as an anti-oxidant and anti-inflammatory agent for cardiovascular protection. Cardiovascular and Hematological Disorders – Drug Targets. https://www.ncbi.nlm.nih.gov/pubmed/17584048. Published June 2007. Chacko SM, Thambi PT, Kuttan R. Beneficial effects of green tea: A literature review. Chinese Medicine. https://www.ncbi.nlm.nih.gov/pmc/articles/PMC2855614/. Published April 6, 2010. Yasutake T, Nakaya N, Sone T. Green tea consumption and the risk of incident functional disability in elderly Japanese: the Ohsaki Cohort 2006 Study. The American Journal of Clinical Nutrition . https://academic.oup.com/ajcn/article/95/3/732/4576690. Published January 25, 2012. Virtanen JK, Mozaffarian D, Chiuve SE, Rimm EB. Fish consumption and risk of major chronic disease in men. The American Journal of Clinical Nutrition. https://www.ncbi.nlm.nih.gov/pubmed/19064523. Published December 2008. Gopinath B, Flood VM, Rochtchina E, McMahon CM, Mitchell P. Consumption of omega-3 fatty acids and fish and risk of age-related hearing loss. The American Journal of Clinical Nutrition. https://www.ncbi.nlm.nih.gov/pubmed/20534742. Published August 2010. Stave Off Cognitive Decline With Seafood. Rush University Medical Center. 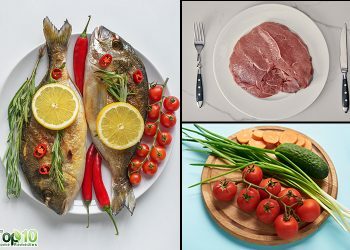 https://www.rush.edu/news/press-releases/stave-cognitive-decline-seafood. Pilkington SM, Watson RE, Nicolaou A, Rhodes LE. Omega-3 polyunsaturated fatty acids: photoprotective macronutrients. Experimental Dermatology. https://www.ncbi.nlm.nih.gov/pubmed/21569104. Published July 2011. Champeau R. Study finds that broccoli may help boost the aging immune system. UCLA Newsroom. http://newsroom.ucla.edu/releases/ucla-study-reports-broccoli-may-46578. Published March 6, 2008. Mills KF, Yoshida S, Stein LR. Long-Term Administration of Nicotinamide Mononucleotide Mitigates Age-Associated Physiological Decline in Mice. Cell Metabolism. https://www.cell.com/cell-metabolism/fulltext/S1550-4131(16)30495-8. Published October 27, 2016. 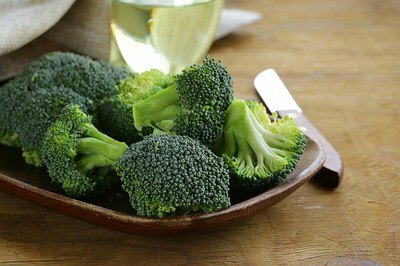 Boosting the potency of a broccoli-related compound yields a possible treatment for mac D. BUCK INSTITUTE FOR RESEARCH ON AGING. http://macularhope.org/boosting-the-potency-of-a-broccoli-related-compound/. Published July 7, 2016. Lisa G. Beneficial effects of olive oil phenols on the aging process: Experimental evidence and possible mechanisms of action. Nutrition and Aging. https://content.iospress.com/articles/nutrition-and-aging/nua016. Published January 1, 2012. Bowe WP, Pugliese S. Cosmetic benefits of natural ingredients. Journal of drugs in dermatology : JDD. https://www.ncbi.nlm.nih.gov/pubmed/25226001. Published September 2014. Gregoire AC-, Merle BMJ, Korobelnik J-F. Olive Oil Consumption and Age-Related Macular Degeneration: The Alienor Study. PLOS ONE. https://journals.plos.org/plosone/article?id=10.1371/journal.pone.0160240. Published July 28, 2016. Sabatini N, Perri E, Rongai D. Olive Oil Antioxidants and Aging. Food Quality: Balancing Health and Disease. https://www.sciencedirect.com/science/article/pii/B9780128114421000043. Published February 23, 2018. Crozier SJ, Preston AG, Hurst JW, et al. Cacao seeds are a “Super Fruit”: A comparative analysis of various fruit powders and products. Chemistry Central Journal. https://www.ncbi.nlm.nih.gov/pubmed/21299842. Published February 7, 2011. Grassi D, Desideri G, Necozione S, et al. Blood pressure is reduced and insulin sensitivity increased in glucose-intolerant, hypertensive subjects after 15 days of consuming high-polyphenol dark chocolate. The Journal of nutrition. https://www.ncbi.nlm.nih.gov/pubmed/18716168. Published September 2008. West SG, McIntyre MD, Piotrowski MJ, et al. Effects of dark chocolate and cocoa consumption on endothelial function and arterial stiffness in overweight adults. British Journal of Nutrition. https://www.ncbi.nlm.nih.gov/pubmed/24274771. Published February 2014. 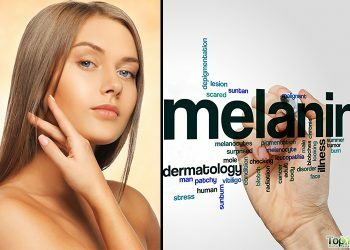 Heinrich U, Neukam K, Tronnier H, Sies H, Stahl W. Long-term ingestion of high flavanol cocoa provides photoprotection against UV-induced erythema and improves skin condition in women. The Journal of nutrition. https://www.ncbi.nlm.nih.gov/pubmed/16702322. Published June 2006. Neukam K, Stahl W, Tronnier H, Sies H, Heinrich U. Consumption of flavanol-rich cocoa acutely increases microcirculation in human skin. European journal of Nutrition. https://www.ncbi.nlm.nih.gov/pubmed/17164979. Published February 2007. Williams S, Tamburic S, Lally C. Eating chocolate can significantly protect the skin from UV light. Journal of Cosmetic Dermatology. https://www.ncbi.nlm.nih.gov/pubmed/19735513. Published September 2009. Stahl W, Heinrich U, Aust O, Tronnier H, Sies H. Lycopene-rich products and dietary photoprotection. Photochemical & photobiological sciences : Official journal of the European Photochemistry Association and the European Society for Photobiology. https://www.ncbi.nlm.nih.gov/pubmed/16465309. Published February 2006. Stahl W, Heinrich U, Wiseman S, Eichler O, Sies H, Tronnier H. Dietary tomato paste protects against ultraviolet light-induced erythema in humans. The Journal of nutrition. https://www.ncbi.nlm.nih.gov/pubmed/11340098. Published May 2001. Rizwan M, Rodriguez-Blanco I, Harbottle A, Birch-Machin MA, Watson RE, Rhodes LE. Tomato paste rich in lycopene protects against cutaneous photodamage in humans in vivo: a randomized controlled trial. The British Journal of Dermatology. https://www.ncbi.nlm.nih.gov/pubmed/20854436. Published January 2011. Palomo I, Fuentes E, Padró T, Badimon L. Platelets and atherogenesis: Platelet anti-aggregation activity and endothelial protection from tomatoes (Solanum lycopersicum L.). Experimental and Therapeutic Medicine. https://www.ncbi.nlm.nih.gov/pubmed/22969932. Published April 2012. Karppi J, Laukkanen JA, Sivenius J, Ronkainen K, Kurl S. Serum lycopene decreases the risk of stroke in men: a population-based follow-up study. Neurology. https://www.ncbi.nlm.nih.gov/pubmed/23045517. Published October 9, 2012. Sommerburg O, Keunen JEE, Bird AC. Fruits and vegetables that are sources for lutein and zeaxanthin: the macular pigment in human eyes. British Journal of Ophthalmology. https://bjo.bmj.com/content/82/8/907. Published 1998. Palevitch D, Craker LE. Nutritional and Medical Importance of Red Pepper (Capsicum spp.). Journal of Herbs, Spices & Medicinal Plants. https://www.tandfonline.com/doi/abs/10.1300/J044v03n02_08. Published 1996. Fiedor J, Burda K. Potential Role of Carotenoids as Antioxidants in Human Health and Disease. Nutrients. https://www.ncbi.nlm.nih.gov/pmc/articles/PMC3942711/. Published January 27, 2014. 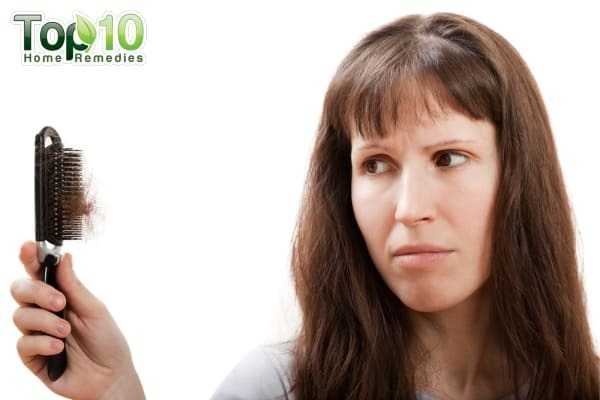 Want to know more about Top 10 home remedies. I think the admin of this web page is truly working hard in support of his site, because here every stuff is quality based data. I appreciate your efforts and praise your patience for taking time to empowered d world for a better living. I so much love the page.More blessings, thank you. I am really happy for this and thanks for the effort. please is there any such for.syphilis and staph? because this are the major culprits in many ailments. This page is a great help for us. The ingredients are all natural and some of it are very easy to find. More power for the admins. And thankyou for the great help. I Like this page top ten home remedies. Plz post facial hair problems. And give some applicable soulations. Thanks. Thank you for giving us very valuable infotmation, as such we follow easily at home, avoiding doctors.